From the dawn of the twentieth century to the early 1960s, public-sector unions generally had no legal right to strike, bargain, or arbitrate, and government workers could be fired simply for joining a union. Public Workers is the first book to analyze why public-sector labor law evolved as it did, separate from and much more restrictive than private-sector labor law, and what effect this law had on public-sector unions, organized labor as a whole, and by extension all of American politics. Joseph E. Slater shows how public-sector unions survived, represented their members, and set the stage for the most remarkable growth of worker organization in American history. 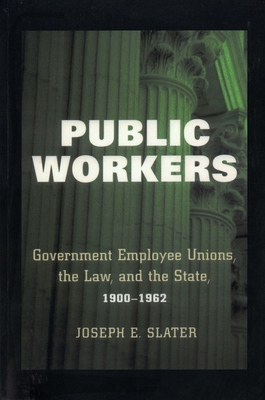 Slater examines the battles of public-sector unions in the workplace, courts, and political arena, from the infamous Boston police strike of 1919, to teachers in Seattle fighting a yellow-dog rule, to the BSEIU in the 1930s representing public-sector janitors, to the fate of the powerful Transit Workers Union after New York City purchased the subways, to the long struggle by AFSCME that produced the nation's first public-sector labor law in Wisconsin in 1959. Slater introduces readers to a determined and often-ignored segment of the union movement and expands our knowledge of working men and women, the institutions they formed, and the organizational obstacles they faced.